1. Preheat oven to 350º. in a mixing bowl combine first seven ingredients and mix thoropughly. Do not over mix as it will cause the meatbals to become tough. Divide mixture into six portions and shape into meatballs. Place on a baking sheet that has been sprayed with cooking spray. Bake until dark bown crust forms - 13 to 15 minutes. 2. Transfer meatballs to a dutch oven. Combine marina sauce and water, and pour over the meatballs. 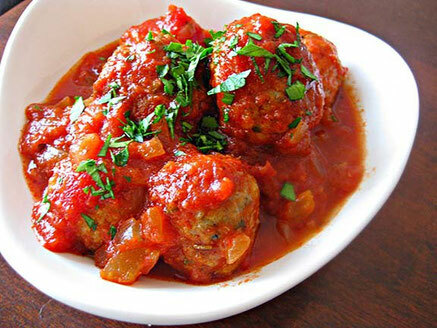 Cover the dish with aluminum foil and bake until meatballs are cooked through, 35 to 45 minutes. Place the meatballs on a platter. Skim the oil from the top of the marina and ladle it over the meatballs. Chop and toss good amount of fresh basil on the meatballs.